I was interested to see that Ohzora Publishing had been added to Jmanga’s lineup. The short-lived Aurora publishing was the previous outlet for some print editions of Ohzora’s lineup, and I did enjoy the three print volumes of Walkin’ Butterfly that were previously re-released. So the combination of a sale on romance manga and some new single volume shoujo titles from an author I hadn’t read before made me intrigued. Serilia of Silver and Knight Princess of Orlelian suffer from the execution issues you might expect in single volume manga, but they might be good choices for people who enjoy their shoujo fantasy manga when it is short and sweet. Aira is a female knight from a poor family who is dedicated to protecting the downtrodden. 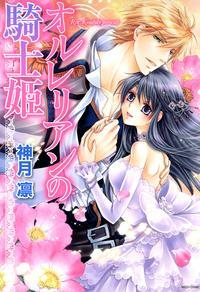 Word of her daring deeds reaches the palace of her kingdom and she’s summoned to act as Prince Rudeylice’s bodyguard. The Prince greets his new knight with a kiss, and Aira quickly slaps him but vows to persevere in her guard duty. As she follows the Prince Rudy along when he visits the townspeople in disguise, she begins to see a new side of his personality when he seems genuinely caring towards his subjects. Rudy’s safety is endangered by the plots of his evil stepmother and Aira’s emotions soon become more complicated when she observes Rudy with his intended fiance. 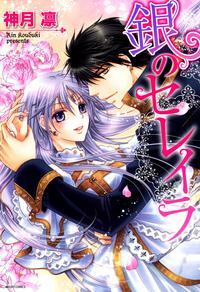 There isn’t much space for quirky character development in a one-volume manga, but Aira and Rudy’s personalities are generally a little bland and they fall in love with great rapidity, with interior monologues like “I’m so happy in his warm embrace…but my heart…is crying…” Aira’s central conflict is her more masculine duties as a knight and her desire to be treated more like a girl, but her knightly uniform of long tunic, stockings, and boots didn’t strike me as all that unfeminine. There’s a bit of surprise twist with an assassination plot, but the ending of this manga is just what you’d expect. Kouduki’s art is clear and easy to follow, and while the quasi-medieval European fantasy setting is a bit generic, this was still fun to read at the sale price. This manga from the same author was a bit more enjoyable because there was a bit more distinctive world building going on, but there was one action of the hero that threw me out of the story quite a bit, due to its inherent squickyness. A woman known only as the “Holy Maiden of Silver” is paraded around at public events and abruptly kidnapped. When she wakes up, she’s in the bed of a handsome stranger who announces that he’s Adill, the king of her country. She claims that he’s a pirate and demands to go back to her temple, only to be informed that she can’t go back because he’s stolen her virginity. Adill gives her the name Serilia since she has only been referred to by her title before. The whole “I’ve despoiled you, so now you are mine” plot development hindered me from enjoying the story. Serilia is weirdly philosophical about the prospect of being deflowered by Adill, and while she does make a few escape attempts, she gradually finds herself seeing that her captor is working to make the lives of the people better. So, squickyness aside, I did find the personalities and world building more interesting in this volume than in Knight Princess. Adill’s actions as king are derailed by the temple, who quickly installs another young woman as a replacement holy maiden. Serilia gradually realizes that she’s been so sheltered she was unaware that her religious sect was keeping the poor even poorer by demanding admission fees from the people who were asking for her prayers. Adill encourages Serilia to learn more about the world outside the temple, and they both choose to dedicate themselves to their country. Serilia begins to develop more agency as she learns more about the conditions in her country. The tension between the religious order and the government was interesting, and made Serilia of Silver a little more involving than a more typical shoujo story. This volume also had a bonus story that showed couples from both volumes meeting that was very cute. I’m a sucker for shared universe stories, so it was nice to get a bit of an epilogue for both of these manga. While these definitely weren’t my favorite titles available on Jmanga.com, they were fine to read at the sale price. I enjoyed these single volumes enough that I am curious to see what Rin Kouduki would do with a multi volume series, with more room for nuanced character development and more complex plotting.